The Conference is organised as part of the OPERAS-D project, whose main objective is the development of a European e-infrastructure for open scholarly communication in the Social Sciences and Humanities. 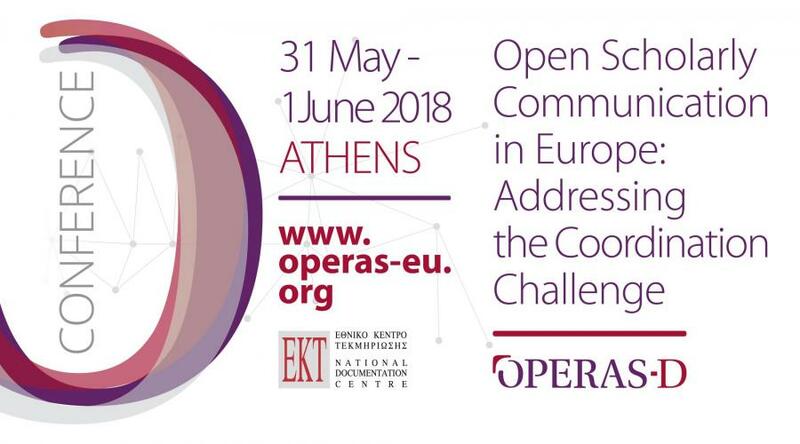 As an active participant in the European OPERAS-D project, the National Documentation Centre is supporting the ongoing debate on Open Access to publications and research data, by organising an International Conference entitled "Open Scholarly Communication in Europe. Addressing the Coordination Challenge", on Thursday 31st May and Friday 1st June, at the National Hellenic Research Foundation (48, Vas. Konstantinou, Athens). The key goal of OPERAS-D (Design for Open Access Publications in European Research Areas for Social Sciences and Humanities) is the development of a European e-infrastructure for open scholarly communication in the Social Sciences and Humanities. Co-ordinator of OPERAS-D is the Centre National de la Recherche Scientifique (CNRS) and its partners the National Documentation Centre, the Open Access Publishing in European Networks (OAPEN), the Deutsche Geisteswissenschaftliche Institute im Ausland (DGIA) and Knowledge Unlatched (KU). The project, funded by Horizon 2020, strengthens the OPERAS network which was created in 2015 by 16 key institutions in the field of Open Scholarly Communication in the Social Sciences and Humanities. The aim is to introduce the principles of Open Science in SSH and to ensure effective dissemination of and access to research results. The Conference will be an opportunity to exchange opinions on scholarly communication in Europe and the changes being brought about by Open Science. The academic community is switching to the Open Science model, particularly in Social Sciences and Humanities, while facing the challenge of effective communication between institutions, disciplines and countries. Conference speakers are eminent figures from Greece, Europe, Canada and Brazil who are active in Open Scholarly Communication. The term ‘Scholarly Communication’ is used to describe the process by which scientists and researchers share, communicate and publish research findings so that they are available to the research and academic communities as well as the general public. The conference is intended for all involved in open scholarly communication activities: libraries, publishers, infrastructure managers, institutions and funders and researchers. To register for the conference, please follow this link: bit.ly/2opwu9b. The conference will be broadcast live at http://media.ekt.gr/live. In 2003, EKT was the first Greek organisation to sign the Berlin Declaration on Open Access to Knowledge in the Sciences and Humanities, and, since then has continued to support all initiatives for the Open Access Movement, acknowledging its multitude of benefits for society. To achieve this, EKT provides Open Access to a large volume of quality scientific and cultural content. e-infrastructures are made available to research and cultural organisations and it provides nationwide services such as the National Archive of PhD Theses. Since 1986, it has also been developing and providing support for scientific and cultural content repositories of Greek libraries through ABEKT (Library Automation and Data Management System) and its most recent version openABEKT. The institution maintains and constantly upgrades openarchives.gr, the largest web search portal to quality Greek scientific content, as well as searchculture.gr for cultural content which enables single search of more than 430,000 items of digital cultural content. EKT’s ePublishing is based on collaboration with research and scientific institutions, to which it offers digital scientific publications management services and infrastructure for the promotion of scientific journals, conference proceedings and monographs. The aim is to develop a strong digital infrastructure, compatible with the qualitative and technical criteria adopted internationally. The service capabilities are exploited to the maximum by adopting innovative publishing models based on the complementarity of the various roles of EKT and its partner institutions following the principles of Open Access and current research trends. The number of visits the above Open Access e-infrastuctures developed and maintained by EKT have received - 8,500,000 in 2017 – is testament to the significant impact they have on Greek society.